Keep feeling and looking your best with Bio-Synergy Pro Collagen and Multivitamin. Every capsule contains a unique blend of collagen, essential vitamins and antioxidants that are specifically formulated to support your lifestyle. Bio-Synergy Collagen and Multivitamin can help promote younger looking skin, healthier hair and nails, a stronger immune system, improved bone health and healthy cognitive and mental functions. Top key ingredients include pure marine collagen, and vitamins A, C, D and E.
One dose of our easy-to-swallow capsules gives you 100% RDA of key vitamins and minerals. One of the main ingredients in Bio-Synergy Collagen and Multivitamin is pure marine collagen, providing you with large amounts of the collagen fibres that make up the structure of healthy young skin. Unfortunately, as we age, these fibres are depleted, which is partially responsible for causing the visible signs of ageing – wrinkles and crow’s feet, for example. But our formula helps to protect and repair the body’s natural collagen, helping to restore your skin’s elasticity. Our easy-to-swallow capsules also provide a range of key vitamins to maintain good health. Vitamin A is a powerful antioxidant that plays a critical role in maintaining healthy vision, neurological functions, healthy skin and more. Vitamin C does a lot more than just maintaining a healthy immune system. It also helps the body form and maintain connective tissue, including bones, blood vessels and skin. And vitamin E is a powerful antioxidant that helps protect cell membranes against damage caused by free radicals. Bio-Synergy Collagen and Multivitamin contains many other beneficial ingredients, including vitamins B1, B2, B3, B6 and B12 to keep you feeling your best. Collagen is a vital structural protein found in the skin as well as in cartilage, joints, bones, ligaments, tendons, hair and nails. IS BIO-SYNERGY COLLAGEN AND MULTIVITAMIN RIGHT FOR YOU? If you’re looking to maintain healthy-looking skin and hair, and take in more vitamins and antioxidants, then yes, Bio-Synergy Collagen and Multivitamin is an excellent choice. We’ve got you covered with a wide range of other healthy products: Body Perfect® Acai Berry & Green Tea, Body Perfect® Raspberry Ketone, Big Red Krill, Matcha Green Tea Powder, Skinny Water® and Vegan Lean & Green® protein. 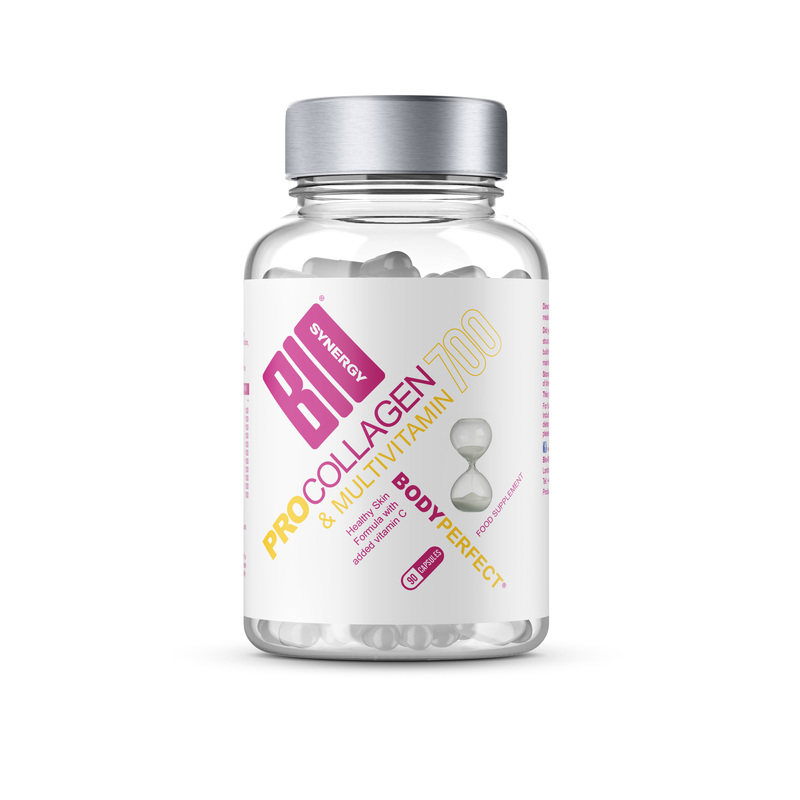 Bio-Synergy Collagen and Multivitamin capsules are made from pure marine collagen, and premium-quality vitamins. What’s more, Bio-Synergy Collagen and Multivitamin is manufactured in our own UK-based facilities by an expert team of scientists. That’s how we ensure every bottle is made to the same high standards. Marine Collagen, Gelatin (Capsule Shell), Ascorbic Acid, D Alpha Tocopheryl Acetate preparation, Niacinamide, Retinyl Acetate preparation, Calcium Pantothenate, Magnesium Stearate, Pyridoxine Hydrochloride, Thiamine Mononitrate, Riboflavin, Folic Acid, Cyanocobalamin preparation, Cholecalciferol preparation. For optimal results, take two capsules per day with water. "I can definitely see a difference and I've only been taking them just over a week. My nails were in tatters due to major stress and hair really dry. Now; my nails are strong and I swear my hair has grown. Will be ordering again and again! Sam"